Communications with the folks at the race have been intermittent, but we've finally got a fresh round of LeMons updates for you. 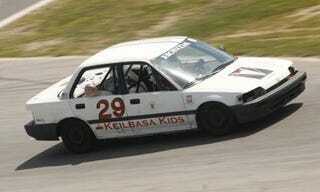 Right now, the Kielbasa Kids Civic sedan sits in first place. That's a photo from last year's New England race, in which the Kielbasa Kids came in a strong second place; as long as that head gasket holds out- always a big question mark with Honda products in LeMons events- they ought to be the team to beat. But there's plenty of racing left; they'll be at it until 10:00 PM tonight, and the Buffalo Knuckles '86 Supra is already breathing down that Civic's neck. In third place is the Scuderia Limoni Alfa Romeo Milano (which finished third in '08), and the fifth-in-'08 Scuderia Testa di Spillo Milano is right behind it in fourth. The fifth-place Volvo 240 wagon run by Team Vermont Cow Tippers is no doubt making the Italians quite nervous- we're all familiar with the storied white-hot drama of world-class 240-versus-Milano competition- and there's just no telling what might happen next! We can tell you what will happen next with the Index Of Effluency contenders, however. The Adopted By Jets '71 Saab 99 blew up early and often, and now sits in 49th place (out of 55), while its team tries to duct-tape it back into running condition; that's better than the Safari Taxi Peugeot 504, which has managed to climb to 50th place between lengthy wrenching sessions. The Craptation Chevy Citation X-11, which Assistant Perp Nick Pon describes as "hands down, one of the most horrible cars in LeMons history," clanked off the track with the driver unable to see past the clouds of toxic smoke pouring from the dash- didn't GM have a Citation recall over that issue, back in the day?- but the team is totally contending for the IOE with an intimidating 44th place. The Trailing Throttle Oversteer '63 Corvair has paid some visits to the Penalty Box, thanks to its Ralph Nader-enraging handling quirks, but has remained in good mechanical shape: 32nd place!